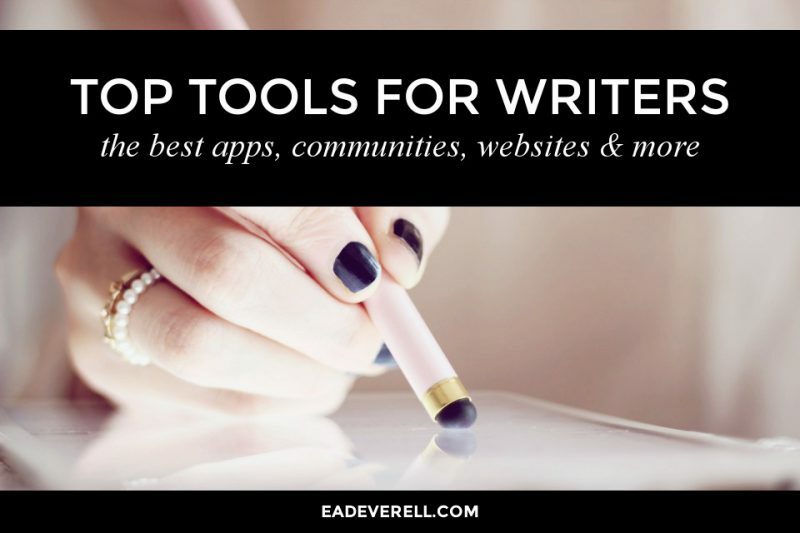 This is a list of creative writing and self-publishing tools, apps and websites + a few extra that I thought would help! 750words – a simple site to keep up a private diary or daily writing practice. You can earn badges and get some neat metrics after you complete your writing. Google Docs – I wrote a whole post about how writers can use Google Docs! Noisli – noise generator and distraction-free writing (with Markdown preview). Write or Die – no other app can make you write faster! A NaNoWriMo staple. Workflowy – a beautifully simple web/mobile app for outlining and list-making. Twine – a visual interface for creating “choose your own adventure”-style stories. Watch this video for a great introduction. Notion.so* – a beautiful web (+Mac & iOS) app for writing and/or creating worldbuilding wikis. Click here to sign up and earn $10 credit. Behind the Name – my favourite resource to research name meanings, and find character names. Webster’s 1913 – a lovely nice vintage alternative to modern dictionaries, especially useful for historical fiction. Wordnik – one of my favourite tools for discovering and collecting words! OneLook – a very powerful search engine that can use various expressions and sort modes, and searches a huge range of dictionaries. Masterclass Writing Classes* – Masterclass offers writing classes from many famous authors, including: James Patterson, Margaret Atwood, R.L. Stine, Malcolm Gladwell, Judy Blume, Aaron Sorkin, and Neil Gaiman. Get 1 month free when you purchase an All-Access Pass using this link. The Writember Workshop – my friend, Faye Kirwin’s beautiful course on making writing an easy, joyful, daily habit. The One Page Novel – my course on how to plot your novel on one A4 page. How to be the Heroine of Your Own Story – my course on how to develop your character (and yourself) on one page. Learn Scrivener Fast* – Scrivener is an incredibly powerful piece of software, but if you’re having trouble getting started with it, this course can help! MyWriteClub – a site for communal writing sprints and word tracking. You can follow me here. 4theWords – a fun, gamified writing community where you battle monsters as you write, complete quests and earn crystals. Wordwar.io – word war chatrooms from the creator of Write or Die. Tim Seabrook Proofreading – Tim has helped me proofread for the Lady Writers League, and if you’re looking for a meticulous proofreader, you can fill in this form to request his help. Amy Taylor Accounting – Amy and her team have been my accountants for years, and if you’re a UK writer who’s overwhelmed by the very thought of accounts and taxes, I recommend seeking their advice. Scrivener for iOS – this is hands-down the best and most beautiful iOS word processor. Notability – this is a great app for importing PDFs (such as writing worksheets) and handwriting over them. Scrivener – excellent for organising (and reorganising) longer projects. If you use Scrivener for novel writing, you might like to download my One Page Novel Template. Notational Velocity – I use this for all odd notes. It’s quick, simple, beautiful, and saves all files as .txt. Flux – Flux automatically adjusts the colour temperature of your screen according to the time of day. I find it really helps me with eye strain! Night Owl – a simple menu app that allows you to schedule dark mode. Like Flux, it helps me when I’m writing in the evening. Noisli – simple and beautiful noise generator which allows you to create and save sound combinations. Lanes – if you’re a fan of the Pomodoro Method, this is a lovely extension that turns your new tab page into a pomodoro timer and todo checklist. Momentum – similar to Lanes, this extension turns your new tab into a beautiful dashboard. Draftback – an amazing extension that helps you visualise the writing and editing of Google documents. Read more here. StayFocused – block yourself from time-wasting sites. I use this to combat my Youtube addiction. Galen Leather – beautiful leather traveler’s notebooks, pen cases, notebook covers and more. CultPens – I order most of my fountain pens from CultPens in the UK. My go-to pens are the Kaweco Sport, Conklin Duragraph and Pilot Penmanship. Paperchase – I love Paperchase padfolios! Ambient-Mixer – Ambient-Mixer allows you to create your own custom soundscapes, or to use ones created by other users. My favourite is this Hogwarts Library mix. Brain.fm – in all honesty, I didn’t think this worked for me, but I’ve seen many people swear by it, so it’s worth a try. Coffitivity – if you’d like to create a café atmosphere in your home, this is the web/mobile app you want. Wattpad – Wattpad’s strength lies in its mobile app which is very convenient for reading. It also provides great opportunities to connect with your readers and some basic metrics on how they are engaging with your stories. – Since my account was deleted without reason or warning, I can sadly no longer recommend Wattpad as a safe platform to share stories. The Productivity Pages – my paper-based goal and task-tracking solution for writers. Todoist – a beautifully minimal to-do list app. RescueTime – automatically tracks how much time you use in each app, and gives you a productivity score based on which apps or websites you designate, “productive” and which “distracting”. Trello* – a task-management app that uses boards, lists and cards. A very nice solution if you like a more visual approach. I also recommend adding the Slim Lists Chrome extension to fit more on your screen. Dropbox* – pair Dropbox with Scrivener’s auto-save and you won’t lose another word. Be sure to backup to several services/locations to be extra safe! DocHub – PDF editor that you can add to your Google Drive contextual menu, or as a Chrome app. SmallPDF – some fantastic PDF conversion and compression tools! PDFEscape – this tool makes me SO HAPPY! You can upload your PDFs and quickly and easily turn them into forms. Love it. Firmbee – a collection of public domain mockups to use for marketing your books. Unsplash – gorgeous public domain photos to use in your blog posts, book covers, or social media graphics. Graphicburger – mockups and graphics to use in your ebooks or emails. CreativeMarket* – a great resource for images, fonts, templates and themes. Don’t miss their weekly free goods! Canva – an online image editor that has pre-made templates for Kindle ebook covers. WordPress – my site runs on WordPress. I love it, although it can be a bit intimidating if you aren’t very tech-savvy. AngieMakes* – my WordPress theme is by AngieMakes. It has a ton of options and I really love it! SiteGround* – my web host of choice. Their premium support is top notch! Hotjar* – create heatmaps of your blog to see where viewers are looking and clicking. Wave – As far as I know, this is the only free accounting solution for freelancers and small businesses, and it works a treat! Links with * are affiliate or referral links. But I promise I never recommend products unless I absolutely love them!